Young Sheldon Review - Does Regressing A Character Make The Grade? - Are You Screening? Young Sheldon Review – Does Regressing A Character Make The Grade? The critic in me that wants to offer up the best information to readers demands that I begin by saying that I’m not the biggest fan of The Big Bang Theory. I like it pretty well, and I laugh when I do catch it, but I’m not addicted and I’m generally content to catch up. Moreover, sometimes I think it goes off on a tangent that’s pretty stupid. On the other hand, I do love everyone involved in the show. That out of the way, the idea of Young Sheldon is one that may throw a lot of potential viewers, and with good reason. I don’t know that we’ve seen anything like this version of a spin-off before, nor do we generally spin-off into different genres. We may get Jim Parsons narrating, and we may be familiar with the character, but this is a show that feels a lot closer to something like The Middle than it does to the show that spawned it. The family-focused comedy takes place when Sheldon Cooper (Iain Armitage) is nine and entering High School. This naturally causes some household difficulty when it comes to his siblings. Having your younger brother in the same class is tricky, but when that brother is calling out half the school for dress code violations and mocking teachers, it can really get rough. Students who ask their math teachers for their credentials don’t exactly become the most popular kids in school. Though there is something of an automatic audience here, the biggest hurdle facing the show is that it’s just another gimmick pasted onto a show we’ve seen dozens of times before, and that’s a theory that isn’t exactly pulling down massive numbers these days. In fact, it’s a theory that is lucky to get renewed at this point. Shows like American Housewife and Speechless, which are both solid efforts, are likewise examples of throwing a gimmick at the family standard and though they’re returning, it’s a struggle at the best of times with most of these efforts. Besides, the automatic audience may not take to this one to the extent we normally hope for with a spin-off. Worse still, beyond everything you already know based purely on the premise, the show doesn’t offer much. 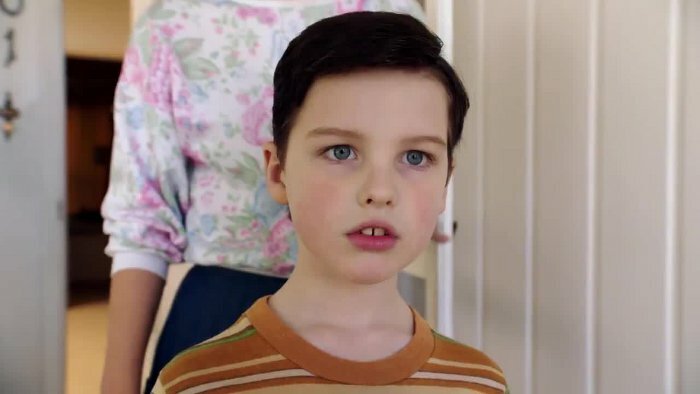 It’s just Young Sheldon being Young Sheldon at the world around him and let the hilarity ensue. His dad coaches the football team, which throws in a little twist at the end of the pilot, and his mom is very protective of him. Now that Sheldon has skipped his way into High School there’s a fairly legitimate sense in which his family is going to have to figure out life as “Sheldon’s family,” and that’s sure to send the world of small-town Texas into a fit of reactionary dysfunction. Whatever might be going against the show, it’s hard to help falling for Armitage and the stroke of genius involved might be the fact that the show doesn’t push the comedy too hard. Whatever you might think of Chuck Lorre and/or his shows, he usually knows where he is in the game, and in this case just following Sheldon around is probably all you need. So, that’s what the show does. Child actors are often tricky, and shows that put them right at the front of things are nearly impossible to cast, but Armitage delivers here. He’s the kind of child actor that makes it a struggle to believe that he needed to audition. If you had the chance to get a feel for what he could do, you’d find a show to put him in if you had to make a new one up. Speaking of auditions, much has been made of the fact that Zoe Perry plays Sheldon’s mother. After all, Laurie Metcalf, Perry’s mother, plays Sheldon’s mother in The Big Bang Theory. Of course, when I say much has been made of the fact, I mean that much has been made of the idea that she still had to audition and earn the role. Yes, pull the other one. I mean, you know, there are no handouts or nepotism in Hollywood. It’s hard to imagine what you were thinking there, such is the purity of the industry. At any rate, she’s conveniently solid in the role, though she doesn’t get quite as much of the meat of the work as you’d expect. At least, not yet. One of the best notes bouncing off young Sheldon is Lance Barber as George Sr., Sheldon’s dad. There’s a difficult balance to be maintained as the father who is constantly exasperated by Sheldon, but buffers the world against both Sheldon and Mom’s protective nature. Especially if we’re supposed to like him as well. Barber hits just the right notes and actually provides most of the show’s comedic notes. If you had ten episodes to judge by, you might be able to call this one, but there’s too much up in the air early on and there’s little indication how the series settles into itself. If it pulls away from its own gimmick however it can, like Speechless, this will likely pull in a strong fanbase, and deservedly so. But, for now, it only has a lot of potential that could easily get lost in how clever it thinks it is.